PRESIDENT Emmerson Mnangagwa has joined other world figures in paying tribute to the late former UN Secretary-General and Nobel Laureate Kofi Annan (80), who died on Saturday at a hospital in Switzerland. Mnangagwa hailed Mr Annan as a devoted champion of peace and an inspirational person following their interaction in the run up to the July 30 harmonised polls. "(Mr) Kofi Annan, the seventh Secretary-General of the UN and Nobel Peace Prize Laureate was an inspiration. I had the honour to spend time with him in the build up to our recent elections. His message of democracy, peace and harmony must continue to reverberate, both in Africa and around the world," he said in a statement posted on his Twitter account. Mr Annan, a Ghanaian career diplomat, was the seventh Secretary-General of the UN and held the post from 1997 to 2006. Last month, Annan was in Zimbabwe leading a team of The Elders on a two-day visit to assess the country's pre-election environment. During the visit, Annan counselled peace and dialogue, calling on politicians not to incite violence. He also urged political parties to desist from making unreasonable demands saying they should seek legal recourse if they felt the electoral process was being violated. "Politics is a tricky business, there are demands and there are demands. What is important is that we all play by the rules and we make reasonable demands, if we make demands which are unreasonable and which cannot be fulfilled we are complicating the process. So, I would urge everyone to be reasonable and operate within the rules, question where there is need for questions and if they feel aggrieved use the legal mechanisms to get redress," he said at the time. "But we should be careful of what we say and what we demand, because the main thing is not to incite. If you incite the population you never know what happens and this is the last thing that the nation and the people of Zimbabwe need." In a statement announcing his death, the Kofi Annan Foundation said: "It is with immense sadness that the Annan family and the Kofi Annan Foundation announce that Kofi Annan, former secretary-general of the United Nations and Nobel Peace Laureate passed away peacefully on Saturday, 18th August, after a short illness. His wife, Nane, and their children Ama, Kojo and Nina were by his side during his last days." The Kofi Annan Foundation said Annan was a global statesman and deeply committed internationalist who fought throughout his life for a fairer and more peaceful world. "During his distinguished career and leadership of the United Nations, he was an ardent champion of peace, sustainable development, human rights and the rule of law," said the Kofi Annan Foundation. Current UN chief Antonio Guterres said Annan was "a guiding force for good" while Russian President Vladimir Putin described him as a "remarkable person". Ex-United States President Barrack Obama said Annan had always pursued "a better world". UK Prime Minister Theresa May and Nato chief Jens Stoltenberg were also among those who paid tributes. 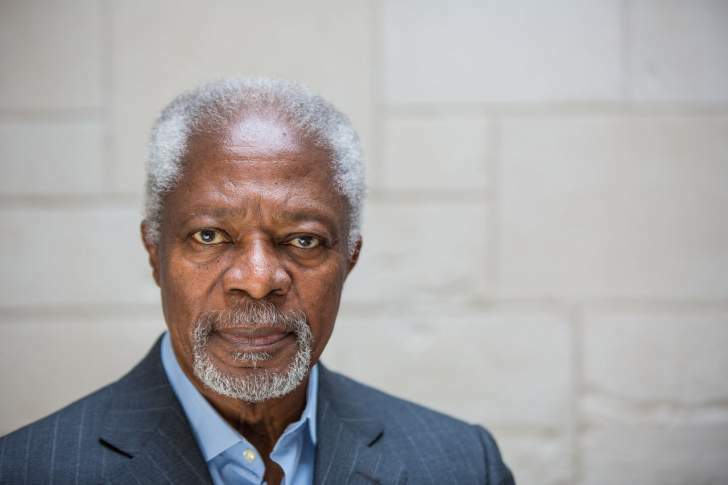 After stepping down from the UN, Annan continued to work tirelessly in the cause of peace through his chairmanship of the Kofi Annan Foundation and as chair of The Elders, the group founded by the late former South African President Nelson Mandela. Annan and the UN shared the 2001 Nobel Peace Prize for efforts to reform the world body and give priority to human rights issues.